Pokémon GO Creator's Twitter Account Hacked — Pika, Pikaaaa! Twitter account of another high-profile CEO has been hacked! This time, it's Niantic CEO John Hanke, the developer behind the world's most popular game Pokémon GO. And it seems like Hanke is so busy with its newly launched game Pokémon GO that he hasn't noticed or took any measures against it even after over 12 hours of the hack, as the tweets made by hackers are still displaying on his Twitter timeline (at the time of writing). 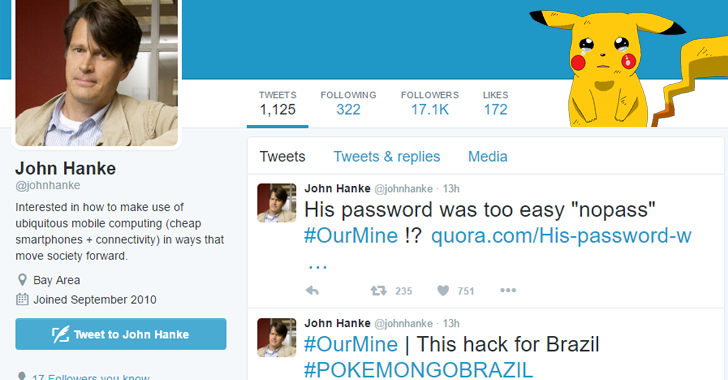 OurMine claimed responsibility for the hack, which was spotted after the hacking group managed to post a series of messages on Hanke's Twitter timeline. It appears that OurMine managed to post on Hanke's Twitter timeline after hacking his Quora account. One of the tweets posted by the group claimed the hack was for Brazil, where Pokémon GO has yet to be released. Pokémon GO has become the world’s most popular mobile game and people are getting crazy to catch 'em all. The location-based augmented reality game allows players to catch Pokémon using their device's camera and is officially available in only a few countries. Another tweet claimed that Hanke's password was "nopass." OurMine claims it is testing out the security of accounts and teaching people to secure their online accounts better, though it also offers its support to those it targets, charging up to $5,000 for a "scan" of their social media accounts, site security holes, and other security flaws. The hacks of high-profile CEOs social media accounts could be due to recent mega breaches in LinkedIn, MySpace, and Tumblr that exposed almost one billion credentials. You are advised to change your passwords for all social media sites as well as other online accounts immediately, especially if you are using the same password for multiple websites. Also use a good password manager that allows you to create complex passwords for different sites as well as remember them. We have listed some best password managers here that could help you understand the importance of password manager and choose a suitable one.